Former rivals are burying the hatchet to take on cloud competitors. The big-data software industry changed recently, when mid-cap software companies Hortonworks (NASDAQ:HDP) and Cloudera (NYSE:CLDR) decided to merge. The all-stock deal should close in early 2019. Hortonworks shareholders will receive 1.305 shares of Cloudera for each of their shares, for about 40% of the combined company. Cloudera shareholders will own the remaining 60%. The combined company will have revenue of $720 million and over 2,700 customers. The merger combines the only public "pure plays" on Hadoop, an open-source big-data technology. However, Hadoop is now something of a catchall term for other open-source software as well. Cloudera CEO Tom Reilly says the company now works with 26 other open-source software projects to deliver a variety of big-data insights. Of course, open-source means the underlying code is free for others to use. The expansion of these services has enticed companies large and small to get into the race. It thus appears the two leaders thought it best to team up amid the competition. So there's a bit of a defensive quality to the merger, but the companies are playing offense as well. While Cloudera and Hortonworks use the same open-source code base, each has been investing in different but complementary parts of the big-data market. Hortonworks has invested in "edge" products that ingest data, as part of its Hortonworks DataFlow offering. At the same time, Cloudera has invested heavily in the processing part of big data, including machine learning and artificial intelligence (AI), via both its own research and development and the acquisition of Fast Forward Labs last year. The combined companies will offer an enterprise data cloud, an end-to-end platform that includes data ingestion, warehousing (the new segment) and advanced analytics and AI (the current core) across all private data centers and public cloud. Can one get big on open-source? No doubt the combined company will be stronger than each alone. Management pointed to $125 million in cost synergies, even after accounting for reinvestment. By 2020, management projects operating margin over 10%, a far cry from the negative 19% margin of today. The primary benefit cited by management was the ability to invest faster in growth opportunities. These opportunities could be large. The current markets in AI, advanced analytics, and dynamic data management add up to $13 billion but are set to grow 21% annually through 2022 to $32 billion. In addition, both companies are eyeing the traditional database and data warehousing markets, which together should reach $51 billion by 2022. Of course, those markets are already crowded with the likes of Oracle, the cloud giants, and upstarts like MongoDB. 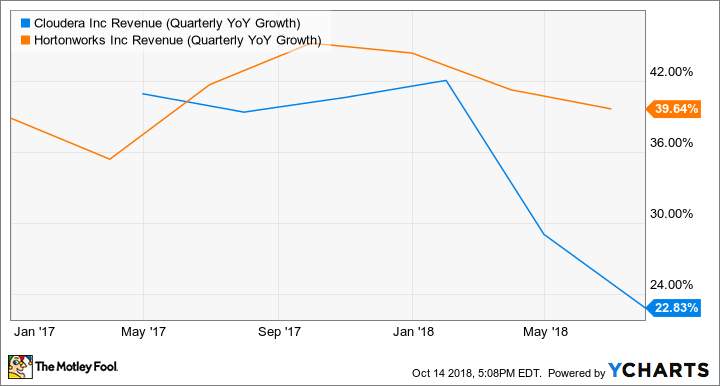 Cloudera management mentioned the new target markets on its last conference call, but since it's still unprofitable, the company likely realized it needed more firepower to get in the game. Both companies envision a time when "new Cloudera" could be mentioned in the same breath with the enterprise giants like Oracle, citing a long-term operating-margin target of 30%. Both companies likely realized they would have to merge to realize that potential. Currently, there aren't many large open-source companies -- Red Hat is an exception with a $21 billion market capitalization and an operating margin of 15.7%. There shouldn't be too many integration risks between Hortonworks and Cloudera, as both companies work off the same open-source code base. Nevertheless, one has to ask why these companies felt that now was the time to merge. Are dangers lurking? The headwinds have come from competitive threats that include legacy players like Amazon, with its Elastic MapReduce, and privately owned MapR. Database powerhouse Oracle isn't standing idly by either, buying start-up DataScience.com last May. Speaking of start-ups, new entrants such as cloud-only Databricks and Qubole have sprung up in just the past few years. All of this means that Hortonworks and Cloudera would be operating in a more competitive environment, though both are still leaders in the industry. I've owned Hortonworks for some time and have been pleased with the results, though it has been a volatile stock. I'm planning to stick with it after it becomes part of Cloudera. Each company's scale should enable it to become profitable in short order, and open-source big-data software seems to have a large tailwind behind it. Though competition is intensifying, the new company should be a stronger player in a large, growing market, making it a "hold" for me at this point.